Oogstgoed is Rony Nekkebroeck (left) & Benny Van de Velde (right) and was founded in June 2014. Then they found a suitable field for their self-catering farm in Gentbrugge (Gent, Belgium), on the edge of the beautiful Gentbrugse Meersen. Rony already had experience with running a farm and team up with Benny who had a background in Bio-engineering and had been fighting for a more fair and sustainable food chain. Together, they started a CSA farm. CSA stands for Community Supported Agriculture, agriculture carried by a group of people or a community. Which basically means that food is not thrown on the market at the whims of supply and demand. In CSA, customers buy membership at the beginning of the year and get whatever the farmer grows. Basically, they share the risk and rewards with the farmers. 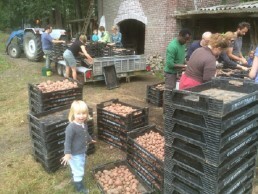 At Oogstgoed, members also go and pick vegetables, fruit and herbs themselves. This happens all year round. In this way, they are closely connected to the Rony and Benny, the food they grow and the good and bad parts of the farming life. Next to a high involvement of the members, Oogstgoed grows up to 200 different vegetables, herbs, fruits and even mushrooms. They also uphold strong social and ecological principles. Want to know how they pulled it of, learn about the 12 steps Rony and Benny undertook to transform their vision into reality, check the 2 videos below.